What determines the standard of care for medical malpractice claims? In a malpractice case, establishing the standard of care is a crucial part of proving negligence. For a doctor or care provider to be negligent, he must have deviated from the expected action of a reasonable professional in his position. The standard of care refers to the actions that should have been taken by a provider in the defendant's field of expertise, given the patient's symptoms at the time of treatment. The standard of care is sometimes referred to as the customary practices of the average physician. In a malpractice case, expert testimony is used to establish the standard of care. This means, doctors or care providers practicing in the same specialty will testify as to what tests should have been ordered, how a procedure should have been performed, or how complications should have been addressed. In cases where there is a difference of opinion among members of the medical community, several different experts will likely be called to testify on both sides. When determining if you have a valid malpractice case, it's important to keep in mind that the term standard of care recognizes that even a well-trained doctor or care provider who does everything by the book can't guarantee a perfect outcome. Complications and poor outcomes are sometimes unavoidable given the limitations of modern medicine. A case only qualifies as malpractice if the defendant's action or lack of action is the cause of the plaintiff's condition. The defendant owed you a duty of care while acting in a professional capacity as a healthcare provider. The defendant violated the standard of care when treating your condition. You have suffered an injury resulting in compensable expenses. Your injury was caused by the defendant's violation of the standard of care. If the malpractice resulted in a patient's death, eligible family members can file a malpractice claim seeking compensation for medical expenses up to the time of death, funeral and burial costs, loss of the decedent's future earnings, and loss of future companionship with their loved one. Although the vast majority of malpractice cases are settled out of court, insurance companies are typically more interested in protecting their bottom line than in providing injured patients with adequate compensation. To protect your rights, hiring a skilled medical malpractice attorney is essential. Neblett, Beard & Arsenault's legal team is committed to helping Louisiana residents who've been the victims of medical malpractice receive the maximum compensation they're entitled to under the law. Contact us online or call us directly at 318.541.8188 to schedule a free, no-obligation initial case review. ?When are knee replacement complications considered medical malpractice? 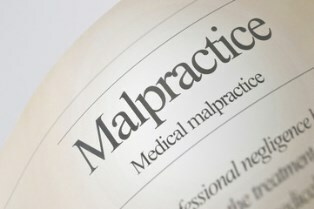 ?What signs indicate I might be a victim of medical malpractice? ?When I sign a consent form prior to surgery, do I waive my rights to pursue a malpractice lawsuit?